This community resilience assessment handbook serves as a user friendly guide for field staff, development practitioners, local government and communities on how to collect and analyse data that can be used to assess the resilience of a community in order to define specific interventions that will strengthen resilience. The handbook has been written to support the field staff of the BRACED alliance partners when they are undertaking the critical community led work, however it will also be relavant for other practitioners working in resilience. This Handbook has been prepared by the BRACED Myanmar Alliance, a consortium of Plan International, Action Aid, World Vision, Myanmar Environment Institute, BBC Media Action and UN Habitat funded under the Building Resilience and Adaptation to Climate Extremes and Disasters (BRACED) program of DFID. It can be downloaded here, or from the right-hand column of this page. The Handbook is structured around the BRACED Community Resilience Action cycle (see Page 6 of the handbook and Figure 1 below) and the Community Resilience Assessment Guiding Questions (see chapter 4 of the handbook). It draws on established tools and methods and provides easy-to-use templates and detailed guidance on tools and techniques to understand hazards, vulnerabilities and capacities, to assist with each stage of the process. Decision-making templates will help users to incorporate climate and weather information and develop scenarios with which to design resilience actions. The Handbook also provides guidance on using historic, current and future climate and weather information to support the community information. In addition the tool also helps assess capacities within communities, identifying existing strengths that can be built upon such as existing disaster plans and strategies. This data is then used to identify and prioritise actions for strengthening resilience to disasters and climate change. The resilience action cycle further presents checklists for screening prioritized resilience building activities to ensure they do no harm. Figure 1: The BRACED action cycle, taken from page 6 of the handbook. The handbook emphasises the use of secondary and scientific data to validate community information and develop scenarios to support community decision making. This Handbook and associated guidance notes will be reviewed and refined throughout the BRACED program based on experience of rolling it out in communities so that it can be utilised by other practitioners developing community resilience projects. The assessment and accompanying handbook are currently being piloted in communities across different climatic zones of Myanmar. The key assessment steps provided in the handbook are given here. Please see the full report for more comprehensive guidance, templates and tips, and an extensive array of tools (provided in the handbook appendex). Review all existing materials available on the location (including past project report and plans) to get an idea of the main issues expected and the different people in the com- munity including literacy levels. Review climate and weather profiles and other available hazard and risk data to understand weather and climate variability and climate extremes in the proposed area. Research the context using secondary sources. Select a team to ensure gender balance, capacity, clear roles and responsibilities and the appropriate number of people in the team to complete the assessment. Prepare logistics for the team (transport, ac- commodation and food). See Box 4 for some specific suggestions. Lead a community meeting to introduce the program and its goals; include discussion about next steps. In this meeting initiate discussion about the most relevant Community Based Organisations to engage with the process and play a role in implementing the resilience activities. Validate this in the Community Resilience Assessment process. Ensure enough time is allowed for discussion and agreement, but recognize that community members are busy and the meeting must fit into their schedules. Complete a Hazard Ready Community rapid assessment: to identify preparedness for climate extremes and disasters. This will help inform the methodology and tools for the rest of the assessment and the follow up visits. *Numerous tools and examples for undertaking this step are provided in the appendix of the handbook and are listed in the next section (please see below). The completed tools will generate a significant amount of information and data related to the targeted communities. This information must be carefully reviewed and analysed in order to determine what priority actions to support a community to become ‘more resilient’ to climate extremes. Meet as a team to synthesise the results and identify key messages and issues: What are the answers to our assessment questions? What does this mean? Compile or summarise the data. Validate findings to check the facts – validate community perceptions against historical climate and weather information. Prepare a report that summarises and synthesises the results. Community reports will be prepared in local languages. It is not expected that the full report will be translated into English; however, a summary sheet for each community should be prepared in English for review and analysis. Following on from the Resilience Assessment and analysis (and possibly at times during the process) the community will identify actions that could be taken to address the issues that arise. Resilience activities can be designed at different scales including individual, household/family and community/village cluster. There are two critical processes to ensure the most appropriate actions are included in the plan: prioritsation and screening. Keep the program goals and priorities in mind when facilitating this discussion. You may need to remind the community what the program is aiming to address. There are various tools and processes to prioritise what may be a long list of possible actions into a manageable list that can be implement- ed in the life of the project. How do these align with the program priorities and goals? It is likely that issues have been identified in the Resilience Assessment processes are beyond the scope or timing of the program. It may be appropriate for the facilitator to work with the group to develop advocacy priorities to take these issues further. The monitoring and evaluation plan for BRACED has specific resilience indicators and a monitoring and evaluation plan that focuses on monitoring of community resilience activities and implementation. Field staff are critical sources of information for monitoring and evaluation. Community led feedback and evaluation processes throughout the project to evaluate progress towards resilience. Field teams should further support the communities to develop a clear set of goals, deliverables and simple indicators of achievement. This handbook is the result of significant review of community disaster and climate risk assessment frameworks, consolidation of DRR and adaptation methodologies and contextual- ization for the situation in Myanmar. 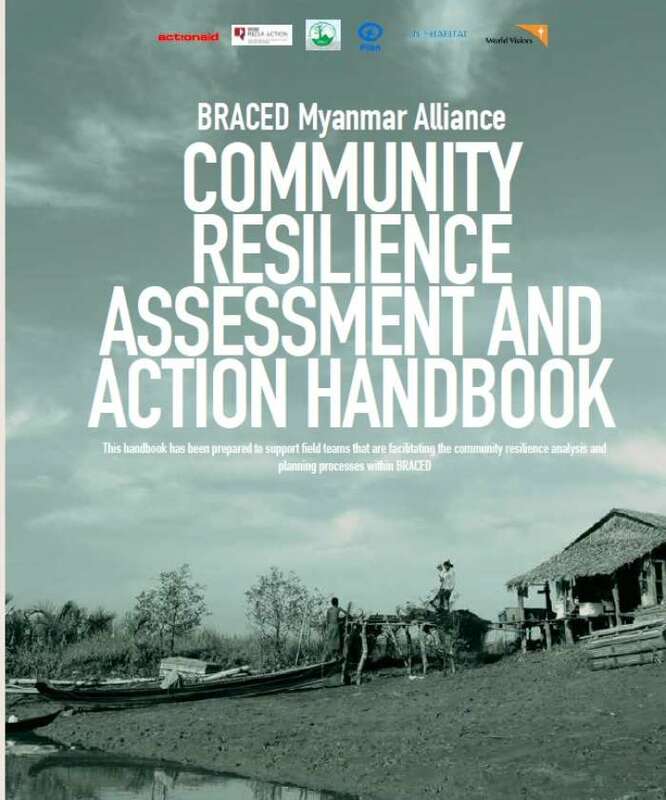 The review and design process of the BRACED resilience model was led by the BRACED Myanmar Alliance Coordination Unit (ACU) including Jeremy Stone, BRACED Alliance Coordinator and Bhushan Shrestha, BRACED Monitoring and Evaluation Manager. This latest version of the handbook was prepared by Julie Webb, climate change adaptation and resilience consultant and design and layout prepared by Landry Dunand.